Broad Spectrum blocks UVA and UVB rays. No sensitizing chemical sunscreens. Dermatologist recommended. Non-comedogenic. Oil Free. This unique formula with transparent film that minimizes white residue. Ideal for daily use by the entire family. For all skin types. Sun Alert: the sun causes skin damage. Regular use of sunscreens over the years may reduce the chance of skin cancer, and other harmful effects due to the sun. 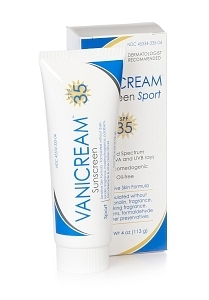 Vanicream™ Sunscreen Sport SPF 35 is a broad spectrum sunscreen that protects your skin throughout the UVA spectrum and provides more protection than your natural sunburn protection (UVB). While all sunscreens protect your skin from the sun's burning UVB rays, Vanicream™ Sunscreen Sport SPF 35 contains zinc oxide, an ingredient that offers additional protection from the UVA rays which may contribute to skin damage and premature aging of the skin. Vitamin E a natural antioxidant, helps prevent damage to the skin by neutralizing free radicals produced when skin is exposed to the sun.